In general 2013 has been a fantastic year for the watch industry. In my capacity as watch editor I have written many exciting articles for Luxurious Magazine. My prime objective has been to cover a diverse range of watch brands including the small independents. I recently discovered Frank Heydrich’s work while doing research for another article. Subsequently this led to an in depth review of one of his exquisite timepieces on my own website. When writing an article I normally like to include a brief biography of the atelier. Frank Heydrich’s story is really fascinating as he is a trained jet engineer. Over the course of his career he has developed several patents for aircraft and high-speed yachts. Essentially his interest in watchmaking began a few years ago when friends asked him to repair their mechanical timepieces. This passion gradually evolved and he now produces his own sophisticated range of watches. All of his creations are made to order and exactly to the specifications of the client. What originally drew me to Frank Heydrich’s work is the unusual choice of materials he uses to construct his dials. As an enthusiastic rock collector it seemed a natural progression to incorporate Meteorite into the design of his watches. As these specimens are over 4.5 billion years old the appearance is completely unique and cannot be replicated by manmade materials. On that basis every timepiece has its own distinctive identity. The Bella Luna is a bespoke one of a kind timepiece and a great example of Frank’s exceptional craftsmanship. Previous models have been manufactured in stainless steel and titanium with case diameters measuring 42mm or 44mm. These classical dimensions should appeal to the majority of buyers and potentially the unisex market. The 42mm watch I reviewed felt very lightweight on the wrist and enjoyable to wear. For that reason I feel this watch would be a comfortable and practical option for everyday use. Visually the Bella Luna is stunning and unlike any watch I have ever seen. 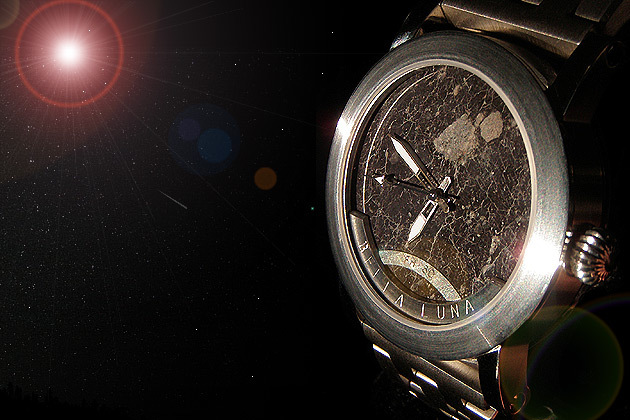 It is also the world’s first timepiece to feature a dial made from a piece of the moon. A lunar meteorite weighing 760 grams was discovered in Morocco in 2009. Frank sourced a select amount of this organic matter and has skillfully shaped the dial to produce an absolutely delightful watch. Apart from the open worked hour/minute hands and the engraved nameplate nothing else detracts from the pure beauty of the stone. Overall the composition is refined and the finishing is first rate. To power the watch Frank has used an Omega Coaxial 2500C Movement, which he procured through contacts in the industry. The automatic caliber comprises 27-Jewels and oscillates at a frequency of 25,200 vibrations per hour. This entire mechanical splendor is visible through the sapphire crystal case back. Functionally the Bella Luna features hours, minutes, seconds and has a power reserve of 48-hours. The Bella Luna is presented with a 24mm stainless steel bracelet and folding clasp. As these watches are custom made, the prices are only available on application.